The preclinical research community responded enthusiastically to Dr. Paul Volden's recent webinar, Next Generation Humanized Mice in Immuno-Oncology, the second webinar in a two-part series on humanized mice for preclinical immuno-oncology (IO). Several questions had to be cut from the presentation for time and are presented here, in full. Q: How many huNOG-EXL mice can you produce from a single donor? Dr. Paul Volden (PV): The number of cells obtained from individual hematopoietic stem cell (HSC) donors varies, and this determines the number of single-donor huNOG and huNOG-EXL mice we can produce. 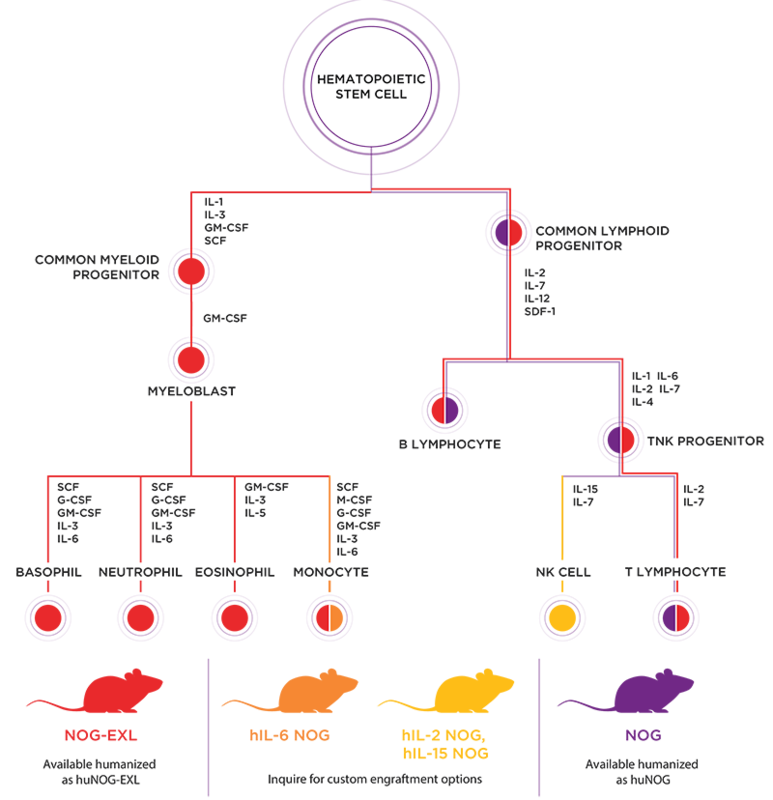 Because we use half the number of cells engrafting NOG-EXL mice compared to conventional NOG, we routinely produce single donor lots that exceed thirty to sixty mice. Importantly, engrafting NOG-EXL with fewer cells still results in higher hCD45:mCD45 chimeric ratios and significantly fewer failed engraftments compared to conventional NOG engrafted with twice as many cells. Q: How many donors would you recommend for studies using huNOG-EXL? PV: A safe recommendation is that you ensure any conclusions you make based upon studies using human immune system (HIS) engrafted models encompasses data from more than one donor. This may seem an obvious statement, but experienced researchers understand how the decision to halt or begin pursuing a particular path often rests upon data from pilot experiments that may be underpowered and/or only performed once. HIS models can capture genetic factors from donors that impact the function of the engrafted immune system. Indeed, data suggests some therapies evaluated in humanized models fail due to inherent properties of the engrafted cells, which may be genetic factors found in the general population. This means single-donor studies run a higher risk of false-negative results. Using more than one donor ensures data can be interpreted in the context of individual donors. Q: Can huNOG-EXL be used to determine therapeutic immunogenicity? PV: Not well, and essentially not at all for humoral aspects of immunogenicity. Immunogenicity tends to require an interaction between antigen-presenting cells and T cells, with functional B cells required for the downstream humoral response. In essentially all commercially-available HSC-humanized models, there is suboptimal interaction between antigen-presenting cells and T cells; the T cells are educated by mouse MHC proteins, while the human antigen-presenting cells present antigen on HLA proteins. Furthermore, super-immunodeficient mice like NOG eliminate murine NK cells through loss of IL2Rgamma signaling, which also leads to disruption of secondary lymphoid structures. Accordingly, human B cells that develop from HSCs tend to be immature and fail to produce affinity-selected antibodies. Q: Are there contract service researchers that have experience running studies with the second-generation models? PV: Yes, and the number increases steadily each year. Two examples represented in the webinar are Champions Oncology, a CRO that specializes in PDX models and with extensive experience performing studies with NOG-EXL mice, and Experimental Pharmacology and Oncology (EPO), our collaborators in the study for evaluating PBMC-engraftment in hIL-2 NOG and hIL-15 NOG. Please reach out if you're interested in connecting with investigators from these companies. Q: What happens if you inject PBMCs into NOG-EXL or IL6-NOG? PV: This question comes up frequently, but we still don't know the answer. A reasonable hypothesis is that one or both models would enhance the support of specific myeloid lineage cells, hopefully without reducing the timeline to graft vs host disease onset. We look forward to seeing or producing data that answers this question directly in the near future. Q: Are there other differences between IL6-NOG and huNOG-EXL immune cells? PV: It's important to keep in mind that both models are still relatively new, and the data on their human immune cell reconstitution and function is still limited. Comparatively, we do know that monocyte numbers in the peripheral blood of CD34+ HSC-engrafted hIL-6 NOG mice appear to be significantly higher than in huNOG-EXL. Furthermore, huNOG-EXL mice have enhanced and functional granulocyte engraftment compared to conventional NOG mice, but HSC-engrafted hIL-6 NOG mice appear to be largely devoid of granulocytes. A proper head-to-head comparison of both models, using HSCs from the same donors, is necessary to accurately compare them. Q: Are there special housing/handling conditions for these mice? PV: Yes and no. If you're already working with immunodeficient models, then NOG, huNOG, and huNOG-EXL should be well within your capabilities for housing and handling. However, it's important to recognize that NOG mice and NOG variants (even when engrafted with human immune systems) are severely immunodeficient and need to be carefully handled.